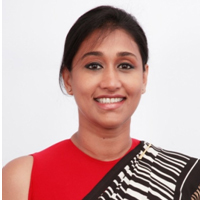 Shalini Ratwatte has over twenty years’ experience as an Attorney at Law in the corporate sector in Sri Lanka. She wasthe Country Representative for the Business Software Alliance (BSA) Sri Lanka Committee for six years before taking on her role at Microsoft in 2013. In her capacityas Head of Legal & Corporate Affairs, South East Asia New Markets, she covers six countries driving awareness and education, enforcement and policy on Cyber Security,Intellectual Property Rights and Anti-Piracy. Prior to specializing in Cyber Security and IP Law, Shalini was in the capital markets industry for over 10 years, though she may be better known for her passion for wild life and conservation and the landmark cases she initiated as a pro bono environmental lawyer at the Environmental Foundation of Sri Lanka.